Bikewriter.com: Derek and the Dominoes: Nobby Clark triggers a major WTF? Derek and the Dominoes: Nobby Clark triggers a major WTF? 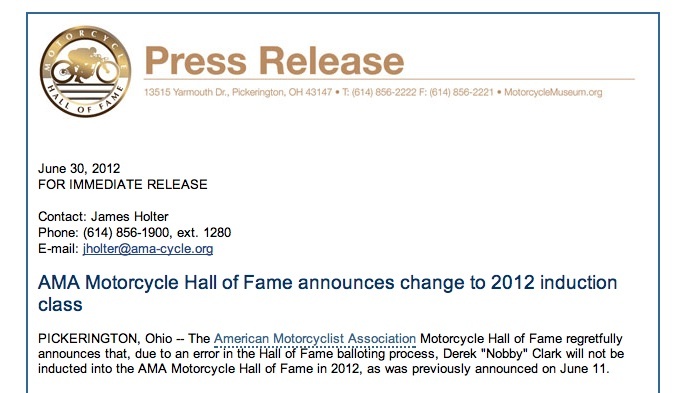 The AMA's recent press release rescinding Derek 'Nobby' Clark's accession into the Motorcycle Hall of Fame triggered so much forehead slapping amongst motorcyclists that it could have been confused for applause for the AMA's mysterious decision. 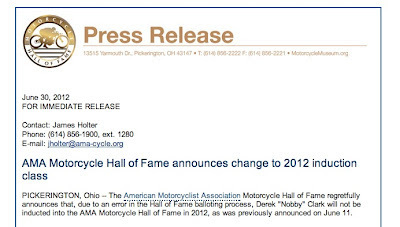 On Facebook, the early consensus was that whatever the cause of the confusion had been, that had resulted in Clark first being listed as one of this year's inductees and then having that honor rescinded before it was even given, the confusion would have been better swept under the rug. Most people said the AMA should just have given Clark the honor. As usual, RoadracingWorld.com has a more detailed and informed perspective on the issue. Reading Dean Adams' email to Roadracing World on the Clark kerffufle won't really clarify much for you, if you're hoping to understand how the AMA actually makes decisions. But Michael Gougis' story (complete with a link to a mug shot!) does make clear why Clarke was removed from this year's Hall of Fame inductees; he was charged and pleaded guilty to theft of motorcycle parts from Rob Iannucci/Team Obsolete. 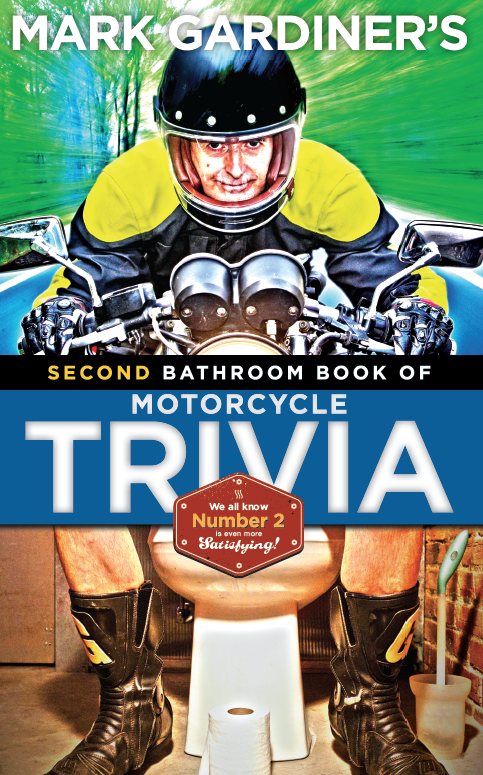 I first met Rob Iannucci in the mid-'90s, when he wrote a foreword for my book Classic Motorcycles. We went for dinner at some little Italian joint in New York, and I spent the evening listening to him recite a litany of perceived slights, mostly at his treatment at the hands of AHRMA officials. I remember him telling me about his falling out with Clark (I think Rob had brought Clark to Team Obsolete to rebuild his priceless 250-6.) While I've long forgotten most of the details of our conversation, I do remember that, at the time, I thought, "There's probably two sides to that story." Rob seems to have mellowed a bit in recent years, but as AHRMA learned, he could be famously obstreperous, really held a grudge, and took a bare-knuckled approach to legal action. I didn't doubt that he could have been vindictive enough to press theft charges just to make an enemy's life miserable. I suppose Clark really did steal some of Rob's stuff; that's the view of the courts, anyway. In the black-or-white legal world, people are either guilty of theft, or innocent. But in the world where we live, it's all shades of grey, and things aren't so certain. Lots of people plead 'guilty' without being guilty, just to get out of a legal situation. It's a little hard for me to understand, if Clark was really guilty of what must have been 'grand theft', that a few years later he was granted U.S. citizenship. I'm sure there are more egregious miscreants in the Hall. But in hindsight, the AMA committee should have paid more attention to Clark's criminal record, and quietly deep-sixed his nomination. While no one questioned Clark's Hall-of-Fame-worthiness, it's not as if he'd be conspicuous by his absence from the Hall -- or that he himself ever expected the honor. Clark is in his mid-70s now. As far as I know, he's still working as a mechanic. Over the years, I've seen him at a couple of motorcycle events, where other old men want to get close to him because he had been close to Mike Hailwood. But like so many people who have devoted most of their lives to motorcycle racing, he left the sport with little more than memories and his reputation. Whatever happened between him and Iannucci certainly damaged his reputation and the AMA's public debacle has brought it all up again. It's demoralizing, the way the AMA seems determined to undermine motorcyclists' faith in our institutions. OK, so, according to the AMA, the problem was "an error in the balloting process." I don't think they've stated what that error was, at all. So, I give up. A total mess it would seem.